Kick back on the best seat in the house, the McDelivery Couch! 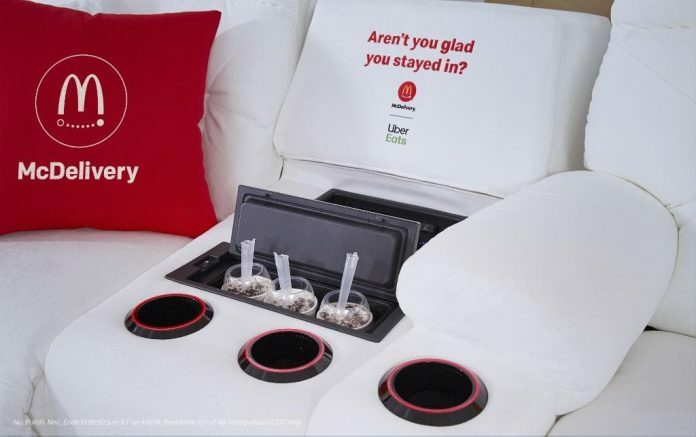 Enter the McDonald’s McDelivery Couch Sweepstakes on Twitter for your chance to win the McDelivery Couch, a custom La-Z-Boy sofa with McDelivery and Uber Eats branding. Tweet the McDonald’s menu items you’d want delivered couch side and tag #McDeliverySweepstakes, @McDonalds and @UberEats for a chance to win the grand prize valued at $9,000. McDonald’s McDelivery Couch Sweepstakes begins at 12:00:00 a.m. ET on March 19, 2019, and ends at 11:59:59 p.m. ET on April 8, 2019. The Sweepstakes is open only to individuals who are residents of the Territory and who are thirteen (13) years of age or older at the time of participation. Limit one (1) Entry per person and per Twitter account per day. One (1) Grand Prize: The winner, once verified, will receive a custom La-Z-Boy sofa, consisting of two (2) two (2)-chair units, each with a center console, light-up cup holder, built-in phone charger, power back, leg and headrest, La-Z-Boy’s iClean fabric and custom accessories with McDelivery and Uber Eats branding. McDonald’s and La-Z-Boy will facilitate delivery and installation of prize in winner’s home. Approximate retail value: $9,000. To find out who won, mail a #10 SASE to: 2019 McDelivery Couch Sweepstakes Winner Request, P.O. Box 1132, Chicago, IL 60690. Sponsored by McDonald’s USA, LLC, 110 N. Carpenter Street, Chicago, IL 60607.